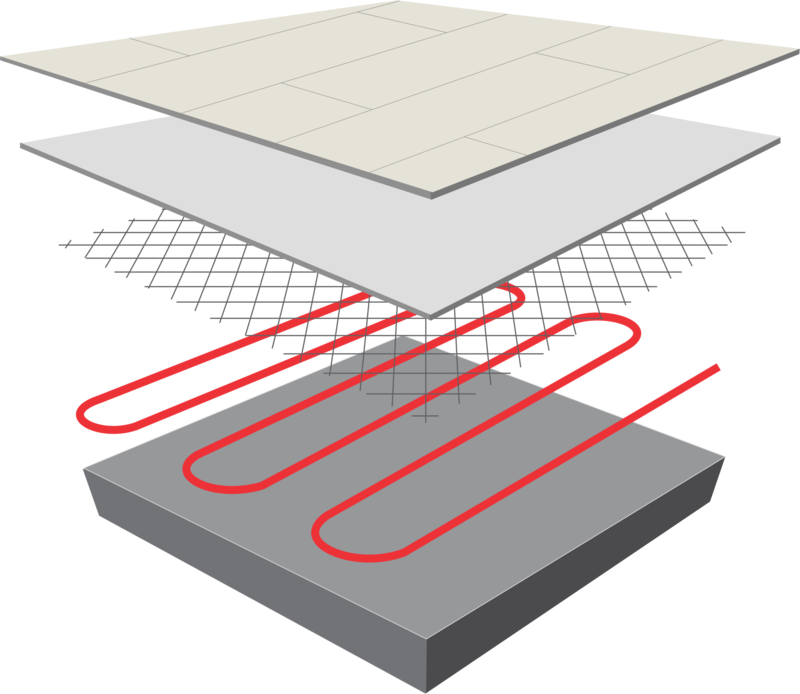 Warmup’s custom-laid heating elements allow full coverage of the floor, evenly heating the vinyl tiles and gently radiating warmth into the room. The cable used beneath vinyls is designed never to overheat and can be left on continuously. However the vinyl flooring manufacturers specify that the floor temperature may not exceed 27’C. A floor sensor then must be used in conjunction with an intelligent Warmup thermostat to control the heating system accordingly. To ensure the vinyls are heated evenly, at least 90% of the floor space must be covered with the heating system. Heating can be installed beneath most clip-vinyl floor systems, however glued vinyls require a different type of Warmup heating solution. A thin, self-levelling screed is poured over the heating system, to bond it to the subfloor and protect the heating cables. The screed must be smooth and level to provide a suitable surface for the vinyls. A fibreglass resin coated mesh is laid over the heating elements to protect the cable and strengthen the screed. Our heating cables are factory tested at 5000 volts, to ensure safety and longevity. The Teflon coated cables are extremely thin, minimizing the overall change in your floor height. The subfloor should be smooth, level and strong, to ensure a good bond between the screeds. Warmup undervinyl heaters are safety tested and are completely waterproof. It is encased in a tough ETFE insulation, which is mechanically tough, has excellent dielectric strength and is resistant to alkali chemical attack in concrete. Discreetly hidden from view, these thin heating elements lie hidden directly under the vinyl. There are no visible elements or radiators, no summertime storage problems. Under any type of clip-vinyl. Glued down vinyl floors require a different type of Warmup heating system. The system must be installed by an installer who is certified by Warmup, to ensure the full lifespan of the product is enjoyed. Undervinyl heaters installed in bathrooms and wet areas must be protected by an earth-shield. Warmup’s earth-braided undervinyl heaters are compliant for use in bathrooms and wet areas.